Trolli Sour Geckos are purchased individually or in a box of 40. 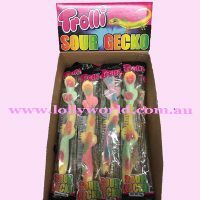 These individually wrapped sour gecko lollies measure approx 17cm long, 1.5cm wide and 1cm thick. These are great for canteens and good value for money. A very popular choice with the children. Trolli Sour Geckos is a box of individually wrapped sour gecko lollies. There are 40 sour geckos each measuring approx 17cm long, 1.5cm wide and 1cm thick. These are great for canteens and good value for money. A very popular choice with the children.